The Traffic and Transportation study will assess and quantify the traffic likely to be generated by the pumped storage scheme during the construction phase and will determine the most appropriate route(s) to the site. 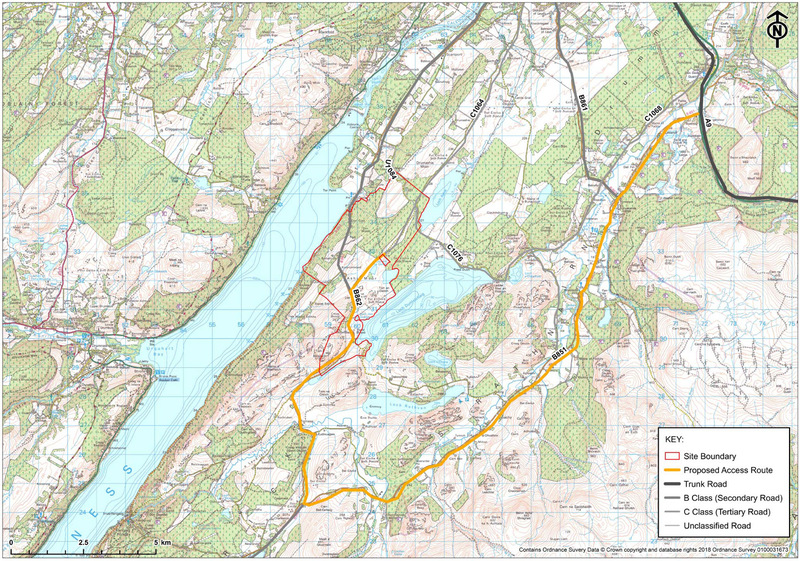 Road access to the pumped storage scheme is possible via a network of roads including the B862 (Dores Road), B851 (Errogie to Culloden Moor Road), B861 (Inverness to Inverarnie Road), C1064 (Ashie Moor Road), C1076, C1068 and U1083 (Darris Road), which make up the study network. The proposed access route at present is along the B851 from the A9 north of the pumped storage hydro and then south along the B862. This route is shown on the map below. No construction traffic will enter Dores and travel north on the B862. The majority of the traffic is anticipated to be generated during the construction phase and will be as a result of a combination of staff in light vehicles travelling to and from the site and the heavy goods vehicles required to transport plant and materials to/from/within the site. The C1064 will be permanently realigned around the headpond. A temporary replacement road will be made available ahead of construction works starting. Site access will utilise existing tracks and minor roads where possible. Other road improvement works may be required. Traffic and transport impacts will be minimised and managed through a Traffic Management Plan, which will take local feedback into account and be developed in consultation with the Highland Council, Transport Scotland and Police Scotland. Let us know your thoughts and help us determine suitable diversions, optimal times for deliveries and routes to and from the site. Access to the pumped storage scheme.